The bones of Triceratops horridus are second in abundance to Edmontosaurus in the bonebed we are excavating in the Upper Cretaceous Lance Formation in eastern Wyoming. Triceratops was built like a tank with massive fore and hind limbs. 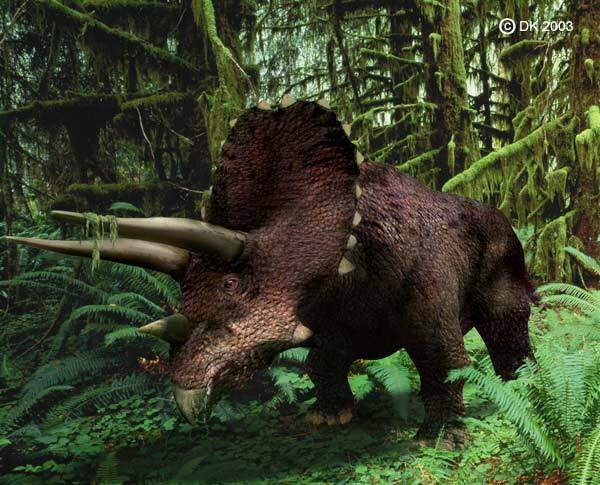 The largest known Triceratops was nearly 30 feet (9 meters) in length and weighed up to 12 tons. This makes Triceratops considerably heavier than the longer and taller Edmontosaurus. The skull, including the distinctive frill and long horns can be up to 7 feet (2.1 meters) long. The photograph below illustrates the skull of a large Triceratops housed at the Munich Museum of Science in Germany. The front of the jaw of Triceratops looks like a giant beak, indicating that it may have been used like a bird’s beak for grasping or cutting food. The teeth are grinding teeth in replaceable rows. Shown below is a predentary from Triceratops horridus. It does look very much like a giant beak! The teeth of Triceratops are huge. Shown is the crown of a triceratops tooth. Skip the Puzzle! Take me to the Museum to see the Triceratops bones.